You are here: Home / What is the cost of a new front door? At some point or other, as a homeowner, you may need to consider replacing your front door. If this is the case, you may be interested to find out more about what is the best type of front door to buy in terms of cost, lifespan and appearance. 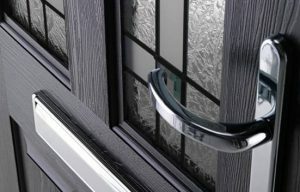 Front doors are supposed to be the first line of defence against unwanted visitors, so it will pay dividends to go for a robust, strong and secure design. Having a lot of glass can be less secure than having a solid door. A solid door is not so easily bypassed by breaking a panel. Hardwood is a good choice for a front door. It is strong, hardwearing and dependable. Softwood front doors, on the other hand, can be prone to swelling & shrining during long dry, or continued wet weather periods. Hardwood which is sealed and properly paint protected does not react as badly as softwood in these situations, but you still have to bear some expansion or contraction. An all-around good performer for a front door. You are dealing with a material that does not have the expansion / contraction characteristics of wood or metal (such as aluminium) and therefore it is stable in this respect, this translates into less draughts or jamming due to size changes caused by the weather. Although direct sunlight will make them expand a little, it is usually well within tolerances to keep them airtight and draught proof.